There is good news and bad news for conservatives. The good news is that conservatives are more likely than liberals to believe there is a culture war underway. The even better news for the Right is that SAGE Cons are the single most attentive and active group when it comes to engaging in that culture war. The bad news is that liberals, overall, are more likely than conservatives to believe that there is a need for significant cultural change in the U.S. these days; they are more likely to describe the need for such change as “urgent;” and they are more likely to participate in a variety of forms of social action. A new nationwide survey conducted by the American Culture & Faith Institute discovered that conservatives are twice as likely to give money to the causes they care about, but liberals are more likely to offer their time and energy. Seven out of ten Americans (71%) believe there is a culture war taking place in the United States today. That view is especially common among SAGE Cons – the Spiritually Active, Governance Engaged Conservative Christians, a segment recently profiled by pollster George Barna in his book explaining the 2016 election results, The Day Christians Changed America. Overall, 93% of SAGE Cons believe there is a culture war raging today. Conservatives (78%) are more likely than both liberals (71%) and moderates (68%) to believe that such a clash of values and beliefs is underway. Do We Need Substantial Change? Surprisingly, though, just three out of every five adults (62%) contend that America needs substantial cultural change. That sense of necessity was most common among SAGE Cons (73%). It was also more likely among born again Christians (67%) than among other adults (60%). Adults with a biblical worldview more frequently identified the need for substantial change (83%) than did the huge majority of adults who do not possess a biblical worldview (among whom just 61% perceived a need for substantial change). Liberals (76%) and conservatives (70%) were far more likely than moderates (53%) to express a need for serious cultural transformation. There were no significant differences by age. Among the six out of ten who identified a need for significant change, two-thirds of them (68%) said that need represents an “urgent priority.” That urgency was most often identified by SAGE Cons (83%) and people with a biblical worldview (77%). The sense of urgency was more common to both liberals (79%) and conservatives (73%) than to moderates (60%). When ten forms of social action were gauged by the national survey, additional patterns emerged, showcasing the heightened commitment to cultural transformation of two competing groups, in particular: SAGE Cons and liberals. Conservatives, in general, were typically no more engaged in transformational activities than were moderates. The most common forms of action, undertaken by half of the adult population, was to speak to other people about social or political issues. Liberals were substantially more likely to engage in such conversations than were either conservatives or moderates. Unexpectedly, SAGE Cons were no more likely than other people to have engaged in such dialogue. A previous survey by ACFI revealed that their reticence was based on the fact that their churches had failed to teach them how to think biblically about current issues, so they avoided related conversations. About one-third of all adults had signed a petition in the past six months. SAGE Cons (57%) and liberals (52%) were the two segments most likely to have done so. Conservatives outside the SAGE Cons segment were notably less likely than either liberals or even moderates to sign social change petitions. One-fifth of adults had corresponded with public officials regarding public policy matters. Again, SAGE Cons and liberals led the way in this activity, with other conservatives and moderates less commonly involved. Similarly, one-fifth of the public had donated money during the prior six months to political candidates or organizations seeking political or social change. Conservatives, in general, and SAGE Cons in particular, were likely to provide funding to such entities. Physical resistance – such as marches, boycotts, and demonstrations – were engaged in by about one out of ten adults. Liberals were at least twice as likely as any other segment to participate in such grassroots endeavors. Running for an elected position was relatively uncommon, with only 4% of the public claiming to have done so recently. Again, liberals were much more likely to jump into elective politics than were conservatives. Even SAGE Cons appear to typically avoid putting their name on a ballot. Another series of questions in the survey found that millions of adults express their views toward retailers and service companies that have taken a stand on a social or political issue by changing their shopping patterns accordingly. Conservatives and liberals alike have changed their shopping patterns to no longer buy products from companies that have taken an unacceptable stand on social or political issues. 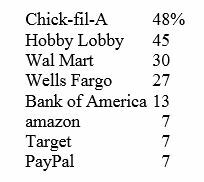 Survey respondents identified more than 70 different organizations whose products and services they are currently boycotting. On the other hand, ideologues often show their appreciation to an organization for taking a stand by going out of their way to patronize an organization because of its stand on an issue. Interestingly, Americans are more likely to boycott an organization than they are to purposefully patronize an organization for its stands. While about one-quarter of all adults (27%) said they have stopped buying products or services from particular organizations because of a social or political stand taken, just half as many adults (13%) said they intentionally support an organization economically because of its sociopolitical stands. Again, the lists of organizations supported differ almost entirely between conservatives and liberals. Putting all of these behaviors together reveals the ultimate effect on organizations from taking stands on social and political issues. When all of the public’s choices are combined, the net impact of taking a social or political stand is more likely to be negative than positive. 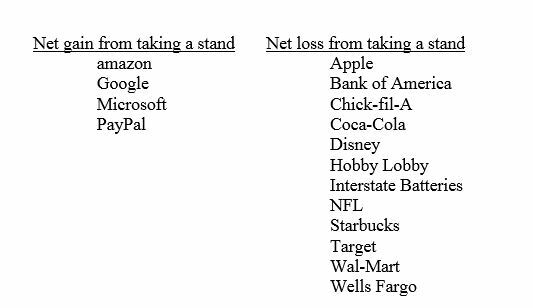 All things considered, the biggest losers appear to be Starbucks, Target, NFL, and Bank of America. The biggest winner is amazon. 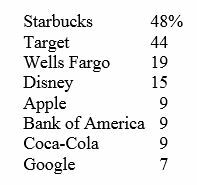 A final observation from the survey is that those on the ends of the ideological continuum were not the only people to engage in rewarding or punishing companies for taking social and political stands. Moderates also engage in such action, though not as widely as do conservatives and liberals. Most interesting was the fact that moderates were more likely than either conservatives or liberals to support organizations for taking a stand. While both conservatives and liberals were twice as likely to boycott an organization as to support it for taking a stand, moderates were equally likely to boycott an organization as to purposefully support one for taking a stand. George Barna, who serves as Executive Director of the American Culture & Faith Institute, and who led the research project, noted that conservatives are being outworked and outspent in the culture war. “Our surveys consistently show that conservatives are usually more likely to vote, but liberals are more likely to engage in most other forms of public persuasion and political activity. When conservatives do get behind specific action campaigns, such as boycotting organizations, the impact is obvious and significant. SAGE Cons are the exception to the rule among conservatives: they are more consistently engaged in social action, but even they are often outworked by liberals. The research described in this report is drawn from FullView™, a nationwide survey with a randomly-selected sample size of 1,003 adults, age 18 or older, whose demographic profile reflects that of the adult population. The online study was conducted by the American Culture & Faith Institute during October of 2017. Additional information about this study and related research is accessible on the American Culture & Faith Institute website, located at www.culturefaith.com. To receive a free copy of the monthly research reports produced by ACFI, visit the website and register for the American Culture Review newsletter.